Welcome to the world of 1 and 0s where there is no middle term. 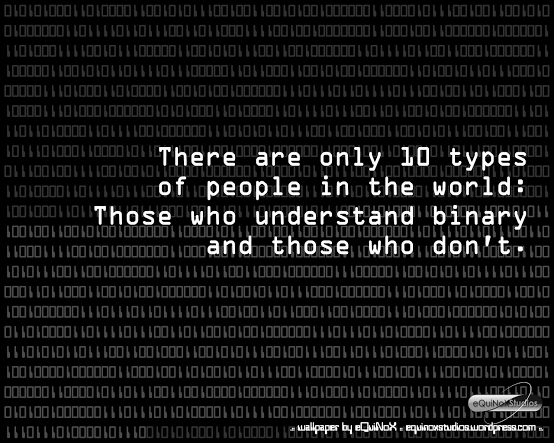 So binary is basically a series of ones and zeros, that can be translated to anything you can think of. Hint for decoding levels 2 & 3, please. and those who didn’t expect this to be ternary. Got it, I wish the Niantic puzzles would all be that easy. I guess I’ll be able to easily decode niantic’s as well at the end of this 101 classes. Thanks Jack for your time and effort in putting up this. I follow this through decryption with Bacon’s Cipher… but how do you know what letters to convert to numbers? Is that a trial and error process? Thanks for the 101 lesson! I’m finding it very helpful and quite entertaining! The code 3vh2nit926p throws me because I would expect the second numeral 2 to remain the letter B in this case, rather than be converted to a digit. That’s good information. Indeed weird that the code wouldn’t follow the pattern. Is the pattern changing? Would they do that to us? There are a few other known formats, e.g., Hint Water codes for one, but I haven’t heard anything about the standard passcode format changing. BTW, I misspoke about that last letter B. The position of that character in the code pattern doesn’t fit as a digit or in the alpha range. So, where you suggested trial and error, I suppose this is a case where you would try either (alpha-numeric equivelent substitution) for this one odd character. At least you only have two options (b or 2). A third option might be that it still must convert in the right alpha range, e.g. B–>b–>p (b inverts to p). Solving these codes sure makes one think outside the box in all kinds of ways. Sweet! It took a bit of effort but I got it!